These are some details about the way we pack safely your parcels and some pictures of our packing system. Boxes ready to be shipped. palms, fruit trees and other potted specimens. Bromeliads and succulents are wrapped in paper too. Some fragile plants will be wrapped individually in this way. Not always - it depends on each case. Tall plants with heavy pots or rootballs will be secured to the bottom of the box. This is an overview of what we ship to your home. This images are for reference only, but they show the look of the items, so you can expect what you will receive. Little by little, we will add more pictures to this page. If you want to see more than this about our plants, then visit our blog. Due to restrictions in the EU, we are not shipping soil, so "soil" is now a mix of peat, coconut fibre, cinder, perlite and other materials that ensure a healthy pest-free plant and also a lighter weight for the shipment. Some of our Palms in the shadehouse. Palms are always shipped with pots and substrate. weak root-system, will be bare-rooted and wrapped in moist sphagnum or perlite. heavy and we know they can stand bare-rooting. 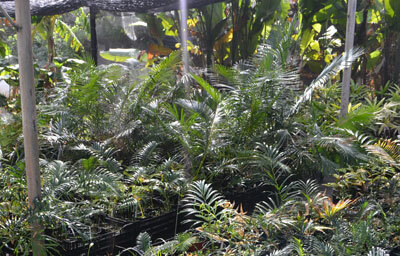 Visit the cycad section in our blog and learn why our cycads have an excellent quality. Bromeliads will be shipped as cuttings, or "pups". Some will already have roots. Some will not, but they will root easily if potted and kept at temperatures of 15-26 C. If temperatures are not matched, they will be able to wait for months until spring comes, because they can live on the water gathered in the tank. Most pups will reach flowering size in one year but the largest species need more time. Large species give large pups: We select and ship to your home cuttings of 35-50 cm for large bromeliads such as Aechmea blanchetiana. Their weight is 300-600 grams. Pups of large species will often lack roots. Small species give small pups. Species like Neoregelia maculata, Aechmea gamosepala or Billbergia elegans can measure 18-30 cm and weight just 120-200 grams. Pups of small species will often have roots. Heliconias are sold as rhizomes with two "eyes" (active growing points). Some will have roots or leaves, some will not. There will be some variation according to the time of the year, because growth is seasonal. Rhizomes are individually wrapped in moist perlite or sphagnum. Most heliconias will quickly root at temperatures of 16-30 C.
"Large" sized trees are sold in 30x14 cm tall pots, plant height can be anything between 30 and 70 cm, depending on season, height of grafting point, etc. Sometimes the trees are too tall to fit in the box - we prefer to keep total height of the box below 90 cm. Longer tips will be bent in the box or cut off, according to our experience. 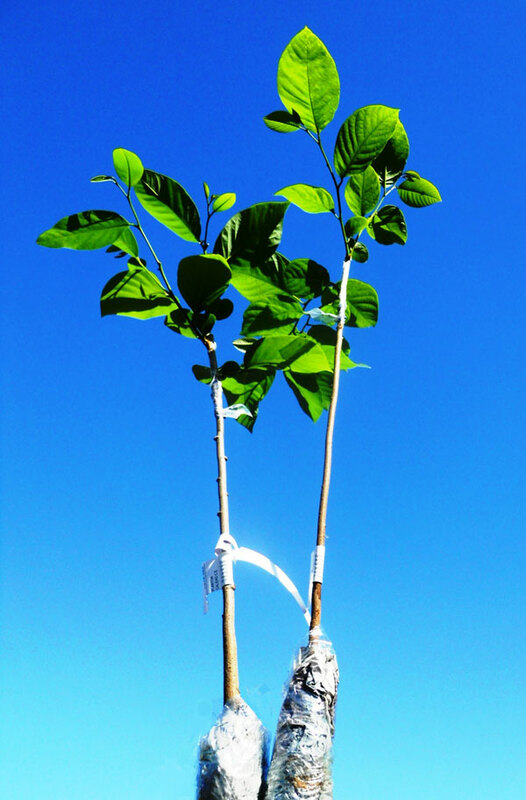 "Small" sized fruit trees are sold in 12 to 16 cm pots. Plant height can be anything between 15 and 50 cm, depending on season, height of grafting point, etc. "Other" fruit trees are sold in other sizes. Papayas are grown in small pots, bananas can be shipped both in pots or bare-rooted, pitahaya dragon fruits are shipped bare-rooted, etc. Read below and see some pictures. 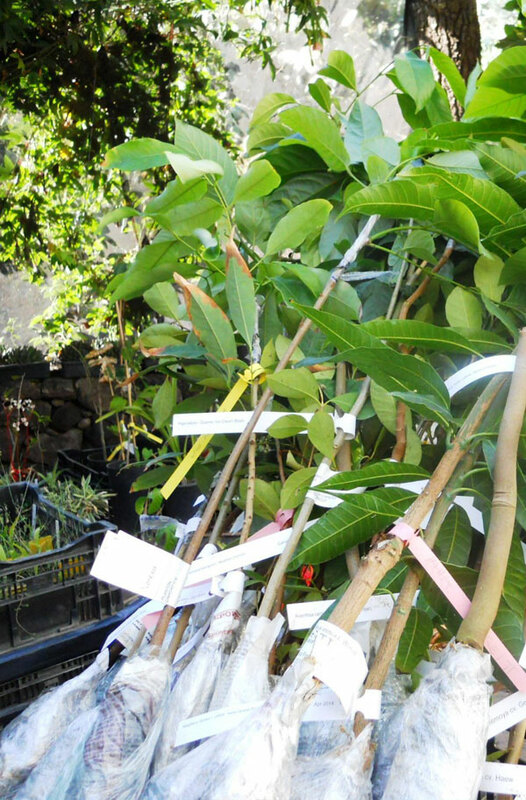 Large sized grafted Mango trees in the 30 cm tall pots. Small-sized papayas have an unpredictable size, because they grow fast in the nursery. Bananas can be shipped both in pots or bare-rooted. We usually ship rooted suckers collected from adult plants. Most banana suckers will quickly set new roots at temperatures of 20-30 C.
Sugar Canes are sold as cuttings, usually packs of two. They will grow very fast if planted at 20-30 C.
Most succulents are shipped with no soil: bare-rooted or as rootless cuttings. Sizes are specified in the catalog. Container size is merely indicative, because pots and soil are removed. Cuttings of Aloe morijensis and other species. We try to avoid shipping pots and substrates, but if roots are too thick or substrate is very light, some succulents might be shipped with pots and substrate, like these Crassula, Fenestraria and Haworthia. If you liked this overview and you want to see more about our plants, you will se many more in our blog. You can also contact us.